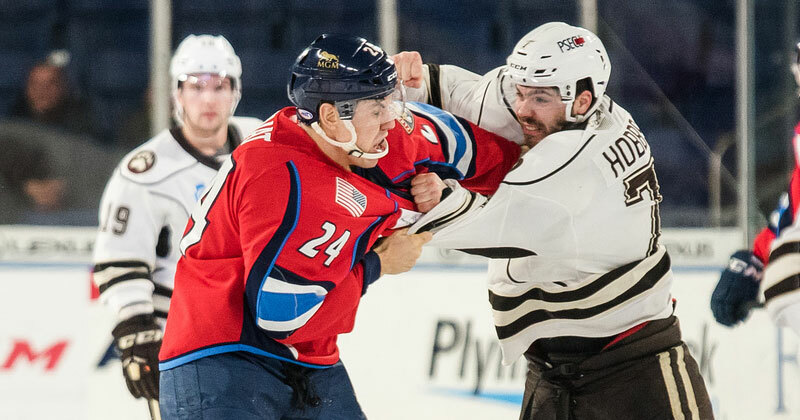 02/06/2019 - The Hershey Bears stretched their point streak to 10 games (9-0-0-1) with a 4-2 win over the Springfield Thunderbirds on Wednesday night at the MassMutual Center. Liam O'Brien scored the eventual game-winner on a first period breakaway, and Ilya Samsonov stopped 35 of 37 shots, setting a new career-high for saves in a single game. The Bears scored the game's first goal for the 15th time in the last 16 games only 7:15 into the contest. Riley Barber received credit for a pin-balling puck in the low slot past Springfield goaltender Samuel Montembeault. O'Brien chipped the initial shot on goal, and after the puck blooped in the air, Barber deposited the puck across the crease at the right post. At 9:40, O'Brien converted on the rebound of his own breakaway try to double Hershey's lead. After Mike Sgarbossa picked the pocket of a Thunderbirds skater at center ice, he fed a headman pass to O'Brien behind the defense. On a delayed penalty from being hooked on the scoring bid, O'Brien scored on the rebound after an initial leg-pad save by Montembeault. The Chocolate and White carried a 2-0 lead into the dressing room and a 15-13 lead in shots. Hershey doubled their lead with two goals in the middle frame courtesy of strong work on the offensive zone forecheck. At the 12:16 mark, Beck Malenstyn forced a turnover in the trapezoid behind Montembeault and fed a perfect pass to Steve Whitney. From the low-slot, Whitney one-timed his fourth goal of the season to open a 3-0 cushion. Only 4:12 later, the Bears capitalized on another turnover product of a hard forecheck. O'Brien used his reach to disrupt a Springfield outlet pass, and the puck bounced perfectly to Garrett Pilon's stick in the low-slot with time and space. Pilon scored unassisted for his fourth tally of the season. At 18:03, Jamie McGinn broke Samsonov's bid for a shutout after burying a backdoor pass from Matt Marcinew. Shots after 40 minutes were 29-24 Springfield with the Bears possessing a commanding 4-1 lead. Paul Thompson brought the T-Birds closer in the third period with only a minute left on a 6-on-4 power play. Christian Djoos was called for delay of game after shooting the puck out of play, and Springfield added an extra attacker with Montembeault on the bench. The Bears survived the final 60 seconds with ease and cruised to a 4-2 final over Springfield. Final shots on goal were 37-30 Thunderbirds. Hershey's power play went 0-for-4 and penalty kill succeeded 3-for-4 in the win. The Hershey Bears return to action on Saturday, Feb. 9 with the first of back-to-back meetings against the Atlantic Division leading Charlotte Checkers. It's Papa John's Pizza Night at Giant Center. All fans will receive a voucher valid for one (1) free Papa John's pizza when ordered online. Puck drop is set for 7 p.m. Ticket information is available online at HersheyBears.com.